The lands of Auchendrane, 3 miles south of Ayr, date back before the 14th Century, when they belonged to Robert Brown. With Brown supporting the wrong side in Robert the Bruce's War of Independence, his lands were confiscated by Bruce so they could be awarded to his loyal supporter, Henry Annan. A branch of the Rowallan Mures acquired the lands of Auchendrane soon after, this seeing raging disputes between the Mures and the Cassillis Kennedy's, situated a few miles south. The disputes came to a head during the Cassillis and Bargany Kennedy feuds. The Cassillis Kennedy's murdered Kennedy of Bargany in a skirmish at Ladycross in 1601. John Mure of Auchendrane, who was present at the Ladycross skirmish, took revenge for his friend Bargany's death by arranging the murder of Cassillis' uncle, Sir Thomas Kennedy of Culzean. As Mure and his son were brought to trial in 1611 for the murder of Thomas Kennedy, and executed, the lands of Auchendrane were once again forfeited to the Crown. Auchendrane lands passed to the Ferguson of Kilkerran, and later, to Elias Cathcart of Blairston, or Nether Auchendrane as it was re-named. In 1839, James Ferguson bought the estate with the intention of building a new mansion house on the site of the ruined castle. However, this was only carried out by J. Fairfull Smith in 1856. 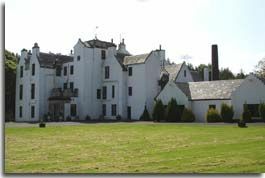 Nether Auchendrane served as a nursing home for many years. With the building needing expensive repairs, the nursing home was moved to a new location. The house was then put up for sale.